Bill Nye, scientist, engineer, comedian, author, and inventor, is a man with a mission: to help foster a scientifically literate society and to help people everywhere understand and appreciate the science that makes our world work. Nye’s fascination with how things work led him to Cornell University and a degree in Mechanical Engineering. After graduation, he headed for Seattle and worked as an engineer at Boeing. His night job became a comedy writer and performer on Seattle’s home-grown ensemble comedy show “Almost Live.” This is where Bill Nye the Science Guy was born. The show appeared before Saturday Night Live and later on Comedy Central, originating at KING-TV, Seattle’s NBC affiliate. With fellow KING-TV alumni Jim McKenna and Erren Gottlieb, Nye made a number of award winning shows, including the show he became so well known for, Bill Nye the Science Guy. The Science Guy show ran on weekends at first and then later on PBS five nights a week and in syndication on weekends. 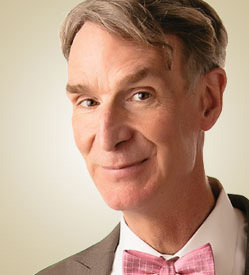 While working on the Science Guy show, Nye won seven national Emmy Awards for writing, performing, and producing. The show won 19 Emmys in five years. In between creating the shows, he wrote children’s books about science. Nye’s latest venture, Bill Nye Saves the World will debut on Netflix this April 2017. In the last two years Nye has released two best-selling books, Undeniable – Evolution and the Science of Creation, and Unstoppable: Harnessing Science to Change the World, where he takes on subjects such as evolution and climate change respectively. When Nye isn’t acting, making TV and film appearances or writing, he is working as a scientist. In the early 2000s, he helped develop sundials that were used in the Mars Exploration Rover missions. Nye is the CEO of the Planetary Society, a non-profit dedicated to the advancement of space science and exploration.